Show/Hide Closed Darwin doesn't work? For now I was able to know four of the six darwins of this trader... where are the other two?... (this is something important... if you analize WWB that was closed ... you may realize that all the four darwins are somehow correlated and that the good results may be a survivorship bias). These are my Darwins. Strategies did not fundamentally change in comparison with the old Darwins such as WWB, etc. 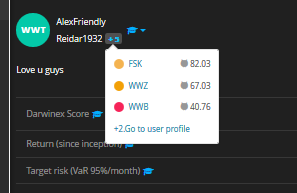 At the moment I try to reduce the risks and bring my VAR to 10% on my current WWT and FSK.